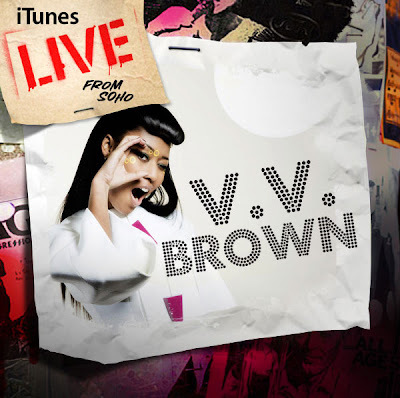 iTunes released a special 'Live From Soho' EP for one of my favorites from across the pond, Ms. V.V. Brown. The six-track EP features Brown doing pretty much the same exact set I've seen her do twice this past year - well maybe a slightly abbreviated version of the same set. The sound quality is terrific considering it's a live show, although it was being recorded professionally so it's not like I was expecting a bootleg off of YouTube. Listening to it I'm able to recall the experience of seeing Brown perform live. The only things missing...Brown's infectious stage presence and colorful costumes. Oh...also a slight difference from the live set I saw, here on the EP Brown also appears to be singing a remix of her 4th UK single, "Game Over." I think she might have sung the album version during the live sets I went to? I don't really care for this mix but still, it's one of my favorite Brown tracks off of Travelling Like The Light so I'll take it how I can it. Boys and girls! The number of UK girl groups is DWINDLING down to near nothing and I don't like it one bit. Back in the day it used to be girl power to the max, with the Sugababes and Girls Aloud ruling the UK charts. This is the case no more. The Sugababes last album and subsequent singles didn't really impress anyone (or make any significant chart moves) and with Girls Aloud on an indefinite "hiatus" the record labels are scrambling to put together the next IT girl group. With the creation of groups like Girls Can't Catch, the Dolly Rockers and The Saturdays, I started to have faith...faith in the future of girl groups...but sadly I am feeling no better. With the recent news of Girls Can't Catch being dropped by their label (Polydor/Fascination), likely due to poor single sales, I can't help but be a little fearful for the future of British girl groups. 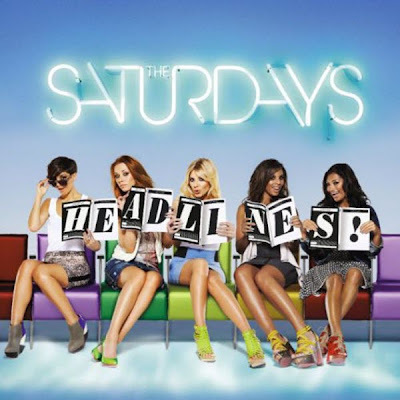 While The Saturdays seem to be making an effort at remaining relevant and PRESENT in an over-crowded pop market, I question the upcoming release of "new album," Headlines. The 8-track "mini album," Headlines, comes out on August 16th and features two previously released singles from the girls' last album, Wordshaker - "Ego" and "Forever Is Over." Why? We know those songs. Both singles peaked within the Top 10, with "Forever Is Over" even going all the way to the #2 spot. It looks like The Saturdays are following in the footsteps of Lady Gaga's the Fame Monster. The only difference HERE is that Gaga's Fame Monster was a mini-masterpiece in and of itself. While I can't say for sure that The Saturdays' new release isn't, I highly doubt every single track is OMG-to-die-for pop music. I will reserve final judgement for August 16th but I'm just putting it out there now that I'm skeptical. First single "Missing You" is released on August 8th and features remixes by Cahill and Steve Smart & Westfunk. Remember back in June when I talked about the new Robbie Williams greatest hits compilation? Well, we now have a tracklisting AND cover art. 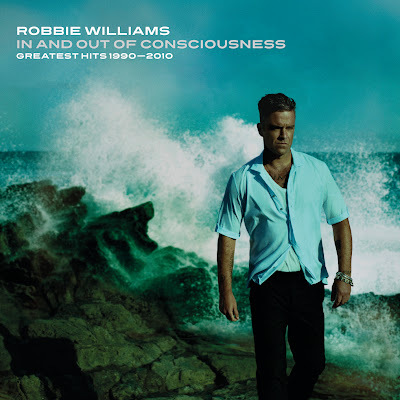 In and Out of Consciousness - The Greatest Hits 1990 - 2010 comes out October 11th (October 12th in the States) and features the single, "Shame" co-written AND featuring former bandmate Gary Barlow, new track "Heart and I" (also written with Barlow) + 37 other favorites from the last twenty years of Williams' career. Isn't the album artwork STUNNING? The photo was captured by photographer Julian Broad (who also handled the cover art for last album Reality Killed The Video Star and it's first single "Bodies") in Malibu, California. What's hotter than Robbie Williams walking on a beach with waves crashing behind him...wind blowing up his button down shirt? NOTHING, as far as I'm concerned! The video for first single "Shame" was filmed in a country/western bar and features Williams and Barlow in a sort of 'Brokeback Mountain'-like situation. I'm intrigued slash a little excited. Oh...and what's more? Robbie Williams will be joining his former Take That bandmates for an upcoming new album AND tour. Looks like Robbie's greatest hits album will be coming out at JUST the right time. "Shame" comes out October 4th. Check out the full tracklisting below and if you haven't seen the video about the new CD check that out HERE. Looks like this Fall is going to be all about Robbie Williams and I think I'm alright with that.